1. Mix the lamb neck fillets with 2 tbsp oil, the zest and juice of 1 lemon, and half the oregano then season and set aside for 5 minutes. 2. Heat a heavy, non-stick frying pan until smoking hot. Cook the lamb, turning often, for 12-15 minutes, until thoroughly cooked or to your liking. Remove and rest under foil. Add the marinade to the pan, bring to the boil and pour over the lamb. 3. In a small bowl, mix the zest of the remaining lemon with the segmented flesh, the olives and remaining oil and oregano. 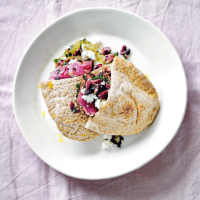 Fill the pittas with the sliced lamb, olive relish and feta.